Rubber will deteriorate when exposed to chemicals such as oil, petrol, salt, antifreeze, and other solvents and airborne contaminants. Over a period of time, when compressed, rubber will acquire a ‘Set’ in the position it has moved to. The consequence is that the bush will quickly cease to function as it was originally intended – even if the car is not used. The driver will experience reductions in quality of handling, steering responsiveness & ride quality, plus a reduction in the life expectancy of tyres & suspension components. By comparison, Polyurethane as a bushing material is not vulnerable to abrasion, does not deteriorate when exposed to air, light or chemicals and retains a perfect memory of its original shape. Fitting polyurethane bushes will therefore ensure that the suspension components retain their designed geometry giving better handling & steering response, longer component & tyre life and an improved ride quality over worn rubber bushes. It will also last significantly longer than the equivalent rubber component. The significant disadvantage of traditional polyurethane bushes, where the original rubber bush is replicated using standard industrial grade material, is an increase in the transmission of Noise, Vibration & Harshness through the vehicle suspension – when compared with NEW rubber. Successfully addressing this issue through the use of unique materials & innovative design has been Superpro’s mission. Using SuperPro not only maintains steering geometry but also enhances the handling and ride characteristics of any vehicle. SuperPro’s unique polyurethane, which is blended with extra mechanical properties, allows the ‘new car feel’ to remain for the life of the vehicle. SuperPro polyurethane bushings remain constant in their durometer or hardness, even under the most adverse conditions such as 4WD or off road racing. Rubber bushings on the other hand increase in durometer when compressed, lowering their ability to function correctly. 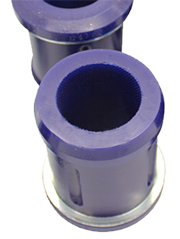 SuperPro polyurethane bushings do not alter in their hardness once they have been cast. The resilience of SuperPro and its ability to return to its natural shape after compression allows the control of Noise, Vibration and Harshness (NVH) in a vehicle. SuperPro products use precision machined aluminium castings which allow for precise fitment. The stringent tolerances used in SuperPro translates to better road holding, increased tyre life, more responsive steering, and longer service life of suspension components. Many Front Wheel Drive vehicles do not have provision for wheel alignment correction, and as the vehicle’s suspension softens with age the vehicle begins to wander or steer off in one direction. Fitting replacement SuperPro polyurethane bushings will help reduce the premature aging of a vehicle’s suspension components by removing the excess compliance in the suspension system and reducing the NVH. The advantage of using polyurethane over rubber in the creation of suspension components has impressed certain engineers and designers so much so that it has become a preferred material for many new and creative concepts involving suspension technology. Polyurethane is used by Original Equipment Manufacturers to rectify inherent design flaws in many applications, particularly in high performance vehicles, without changing the actual design of the suspension. Super Pro is a polyurethane elastomer base material, and is a class of “Thermosetting” synthetic Cross-Chain polymer that involves the reaction of various types of isocyanate resin with curing agents, to give an extremely durable material with the best features of rubber and plastic. Super Pro is unique, it is the only polyurethane product range fully backed by a professional research and development program based on many years of hands on experience in the suspension industry. Since the introduction of polyurethane into the aftermarket suspension industry in the early 80’s many have tried but few have succeeded in manufacturing accurate, durable parts consistently. Anyone can take two jam tins and mix part A with part B, pour it into a mould and get a result. It takes proper management and high technology to achieve the right result every time. Our range covers modern, classic and 4x4 vehicles. We can supply individual bushes as well as complete car sets where appropriate. Alfa Romeo, Armstrong Siddeley, Asia, Audi, Austin, Austin Healey, BMW, Chevrolet, Chrysler, Daewoo, Daihatsu, Daimler, Delorean, Dodge, Eunos, Ferrari, Fiat, Ford, GMH, Hillman, Honda, Humber, Hyundai, Isuzu, Jaguar, Jeep, Jensen, Lancia, Lexus, Leyland, London (Hackney) Cab, Lotus, Mahindra, Macros, Mazerati, Mazda, Mercedes, MG, Mini, Mitsubishi, Morris, Nissan, Opel, Peugeot, Plymouth, Pontiac, Porsche, Proton, Reliant, Renault, Rover, Rover-Land Rover, Saab, Singer, Ssangyong, Subaru, Sunbeam, Suzuki, Tata, Taxi, Toyota, Toyota commercial, Triumph, TVR, Vauxhall, Volkswagen, Volvo. If there are any questions please feel free to contact us .